December is here and I'm so excited, but realizing this year is almost over is unbelievable. Another exciting thing that's happening for me is my birthday! I can't believe I'm turning 25 years old, but I'm so blessed. I'm also doing a "25 Things Before 25" post, so look out for that. During the month of November I blogged everyday and that motivated me, for this month. Have you ever heard of "Blogmas"? I didn't even know about until recently. Is it something that was just created, because I've been clueless for the past fours years! I know on YouTube vloggers do vlogmas. But anyway, if you don't know I will explain it. 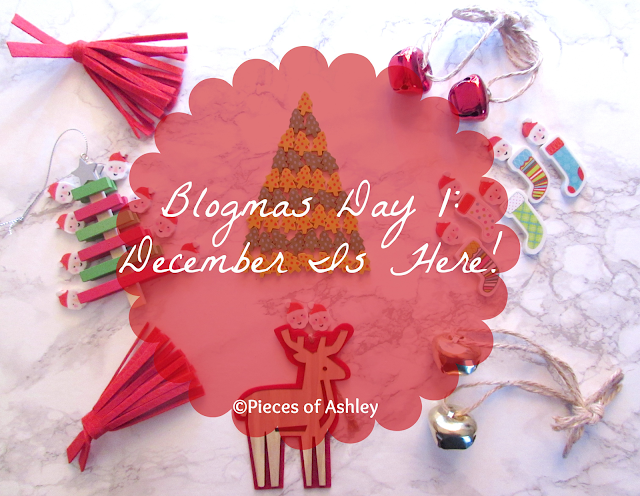 Blogmas is when you blog everyday in December leading up to Christmas. I also heard that it's suppose to be a Christmas theme too. As a blogger I have found it hard to get organized and although I'm not there yet I have planned out my list of blog posts for this entire month. I think I've been bitten by the motivation bug! This Christmas has really got me in the festive mood. I'm looking forward to all of the Christmas movies, songs, decorations, you name it. I'm also looking forward to reading everyone's blog posts. We're all different so it's exciting to find out what everyone else does during the holidays! Has anyone put up their Christmas tree? My mom, sister and I have a couple of days ago. That's a first because it's usually in December when we do that. So stay tuned for some recipe posts, gift ideas and more this month. I hope you enjoyed reading and here's to December and the last month of the year!